Season pork roast with salt and pepper on all sides. Heat a large cast iron skillet or sturdy pan over medium-high heat. 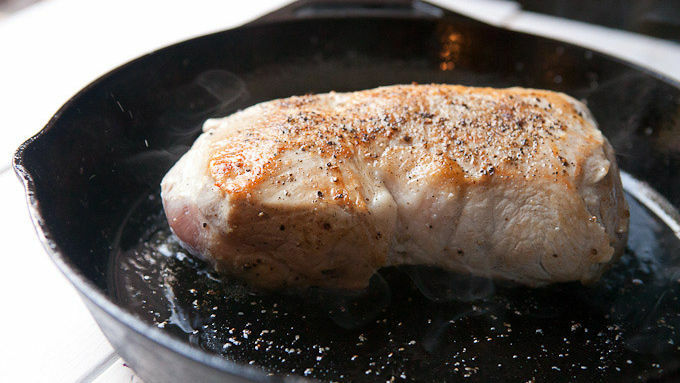 Add oil to the pan and once the oil is hot, add pork roast and sear for 2-3 minutes on all sides. 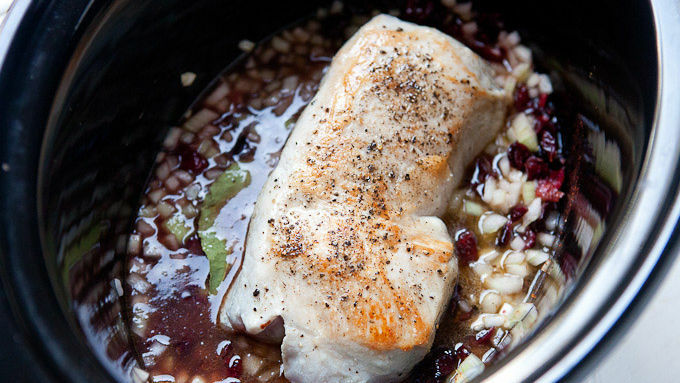 Transfer pork to a slow cooker with chopped onions, dried cranberries, jam, spices and stock. Pour water into the pan used to sear the pork and scrape up any bits in the pan. Pour that liquid over the pork in the slow cooker. Cover slow cooker and cook on high for 90-120 minutes. Test pork temperature with a meat thermometer. It should register 145-150°F in the thickest part of the roast. Remove meat to a serving tray and thicken sauce, if desired, by continuing to cook in slow cooker a few minutes more (or by mixing a teaspoon of corn starch with a teaspoon of water until smooth and whisking it into the sauce). Slice roast into 1/4-inch or 1/2-inch slices. Serve the pork drizzled with sauce from the slow cooker. Pork tenderloin gets a holiday makeover with cranberries, but its easy prep and cooking in the slow cooker can be your secret! 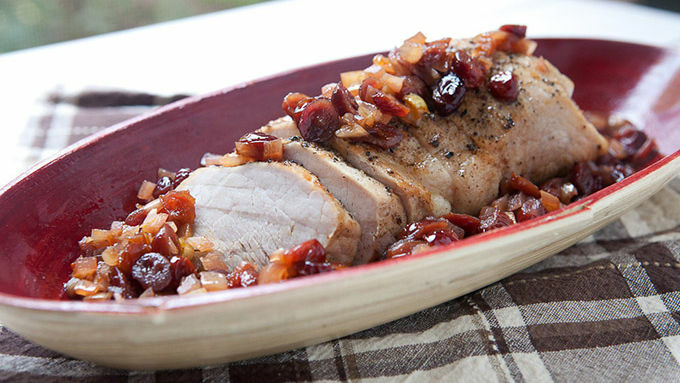 Pretty enough for guests but easy enough for a weeknight – that's this cranberry pork roast. There's a huge amount of recipes during the holidays that require a lot of effort, so it’s helpful to have some hands-off recipes at the ready that you can whip up and serve to impress, but aren’t actually that much work. The slow-cooker is a great tool for these kinds of meals! 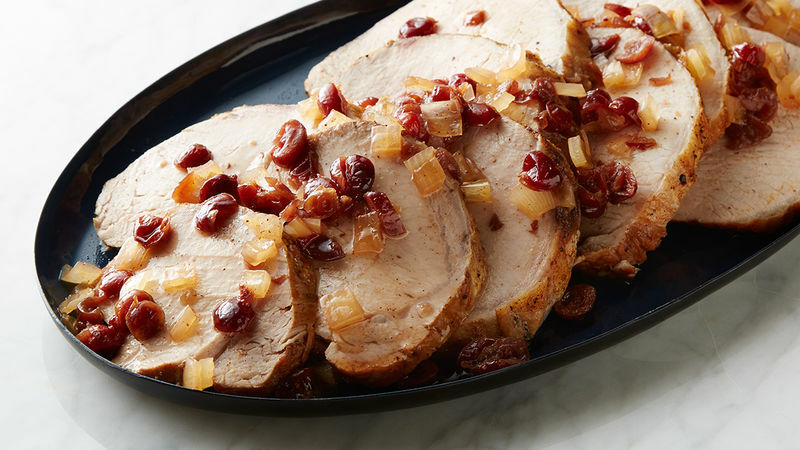 This delicious, savory and juicy pork roast is slow cooked in a slightly sweet cranberry sauce that really brings out the flavors of the holidays. It doesn’t have a ton of ingredients, yet the flavors are really complex and wonderful. 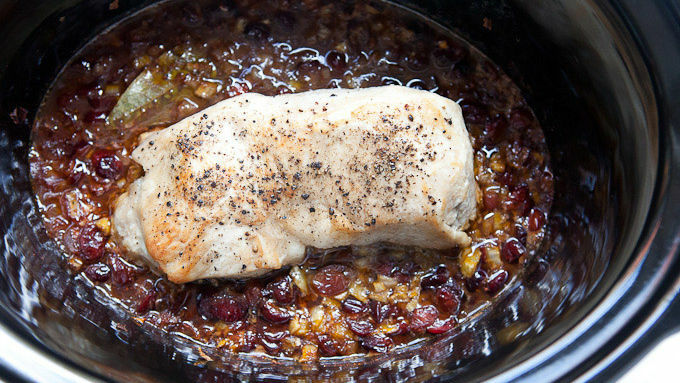 The basic ingredients for the slow-cooker are an onion, some dried cranberries, and some jam. Grape or blackberry work really well. While you could just throw the pork in there at this point, searing the pork first makes the final dish better. This isn’t too hard. Just season it with salt and pepper and sear it for a few minutes per side in a cast iron skillet (or any sturdy skillet). Then adding about a cup of water to the skillet you seared the pork in to scrape up any bits left in the pan, you can pour that liquid in the slow cooker as well. Lots of flavor there! Then let the slow-cooker do its magic! When it's done, just slice the pork and ladle the sauce over the top! All in all, it’s a meal that really seems elegant for the effort it takes. Serve it to your friends and family, but feel free to keep the cooking trick a secret. It’s safe with me!